1. Rock bottom, deepest depth, the extreme low point of one’s experience: It became the nadir of the fortunes of many who invested in the stock plunging many investors into bankruptcy. Efforts by the two political parties to achieve an agreement on the fiscal crisis reached its nadir, with the result that all of the members decided to quit and go home. 2. The worst or lowest point or degree of something: Mary's blood count went to its nadir after the chemotherapy was administered. The mother's nadir resulted from knowing that her three children and her parents all died when the house caught on fire during the night while they were sleeping. 3. Based on an imaginary sphere indicating the placement of stars, planets, etc. 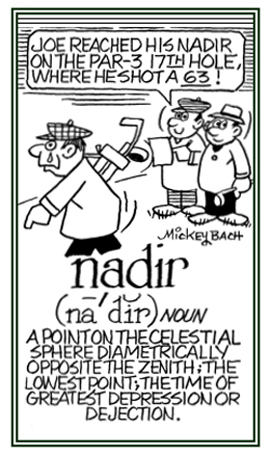 : From the observatory people were able to identify the nadir in the hemisphere as the scientist had explained it. © ALL rights are reserved. 1. To annoy someone by complaining about his or her behavior, appearance, etc. 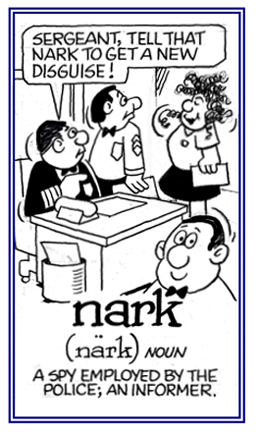 : Mark's wife nags him about not cutting the lawn more often. Jim's mother is always nagging him about his hair style. Mary's parents are always nagging her to clean up her room. 2. To cause a person to feel worried for a long time: Brenda is is still nagged by the thought that she could have done better on the final exam in biology. A reference to being bothered or upset: Joyce told her doctor that she still has a few nagging pains that won't go away and can anything be done to stop them? A state of inexperience, simplicity, childishness: Joshua's naiveté was obvious as indicated in the way he told everyone his life story. Someone who works for the police and reveals what he or she finds out about other people: Melinda has been a nark with the department whose responsibility is to protect the citizens of a community and to arrest those who break the law. © ALL rights are reserved. A reference to that which is indecent or that consists of very bad statements: Shelby nastily described her ex-husband and his cruelties to her. That which is very bad, unpleasant, or indecent: The nastiness of the children's behavior and conversation on the school grounds could not be tolerated by the school staff or the administration. 1. Disgustingly stinky and unpleasant to the extreme: There was a nasty smell coming from the sewer out on the street. The medicine left a nasty taste in Bill's mouth. 2. Improper, disgusting, X-rated: When Ronda turned the TV set on at the motel, she was shocked to see the nastiest videos she had ever imagined possible, which also included a lot of nasty language. 3. Disagreeable, bad tempered, and critical: He played a nasty trick on her for revenge because she had refused to go out with him. Jerry called Karin some of the nastiest things that Shelby had ever heard, but she called him a few that were even nastier and hurriedly walked away. 4. Irritating, unpleasant, or difficult: The nasty rain storms made it impossible for Greg and Shawn to go on the trip as they had planned. 5. Unpleasant, mean spirited, or dangerous: The nasty accident injured several students; especially, the one who had one of the nastiest bumps on his head that the doctor had ever seen. 6. Exasperating, and excessively difficult to solve or to handle: The paper presented a very nasty puzzle which was impossible to solve, but Bill's friend told him that there had been an even nastier the week before. 1. Someone who lives near or next door to, or close to, another person or people: Frank's new neighbors are moving into the house right next door to his. 2. A person, place, or thing located next to another or very close: Mildred's aunt and uncle are also her neighbors because they live just down the street from her. 3. Someone or something which is adjacent to or close to another one: The two countries are neighbors to each other separated only by a river. 5. 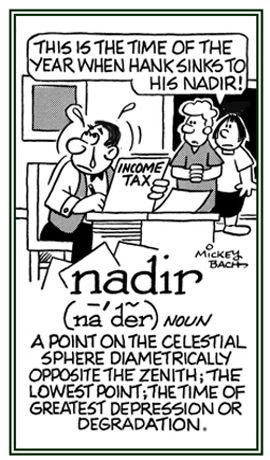 Etymology: The source of our word neighbor is the assumed West Germanic form nhgabr, and was a compound of the words nhwiz, “near” and bram, “dweller, especially a farmer”. A neighbor, then, was a near dweller. 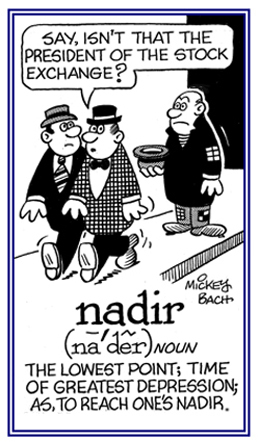 Nahgebr, the Old English descendant of this West Germanic word, and its descendant in Middle English, neighebor, and our Modern English "neighbor" have all retained the literal notion of a situation that probably would have been highly unlikely in earlier times. A new word, involving "neighborhood" is "gayborhood" or a district either explicitly or implicitly understood to be the place to go if a person is "gay"; that is, "happy" or "joyful". 1. An estimate or a guess: Dennis earns in the neighborhood of $100,000 each year. 2. The area in which people, stores, or industries are located: The new computer store in the neighborhood is located close to a railroad station. 3. A collective reference to a large number of people living in proximity to each other: The neighborhood planned an annual BBQ in the park. Descriptive of the nearness of one area to another location: Paul and Myrna drove to the neighbouring county to visit their aunt and uncle. A friendliness or sociability expressed between and among people who live rather close to each other: The neighborliness of the people on the street was much appreciated during the time when Trina's father was ill.
Demonstrative of friendly, compassionate, or helpful behavior: It was a neighborly gesture to take a loaf of fresh bread to the people next door. A description of a situation which is intensely irritating or distressing and causes a person to lose his or her patience: Waiting in the line for more than an hour to go up the CN Tower in Toronto was tiresome, nerve-racking and exasperating. © ALL rights are reserved. Descriptive of places or regions that are at the end, below, under something else: There are nether regions of the Earth that are still being explored by geologists. There are those who believe that sinful people are condemned to the nether region, which is also known as "Hell".